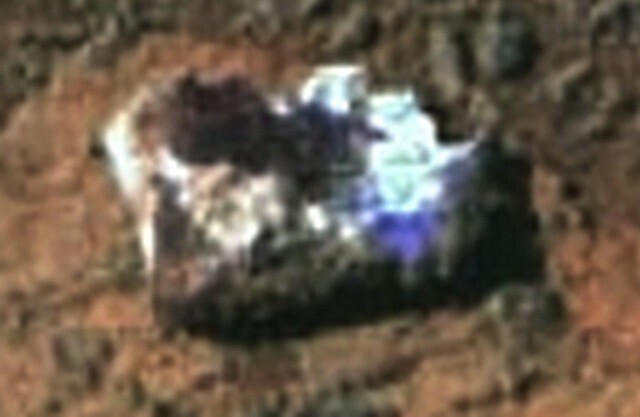 Here's a close up shot of that so named "Jelly doughnut" rock that made the headlines a couple of years ago. The bright reflective light and blinding colors were rarely discussed back then, in the context of "good science" of course! It seems the more you look, the more you find! I was perusing through the Gigapan website looking at the image sent back from Curiosity on Sol 2093 and this little chap caught my eye and what a find! In the earlier finds of these very small beings, it did appear that they were actually dressed in some sort of attire and why not so? 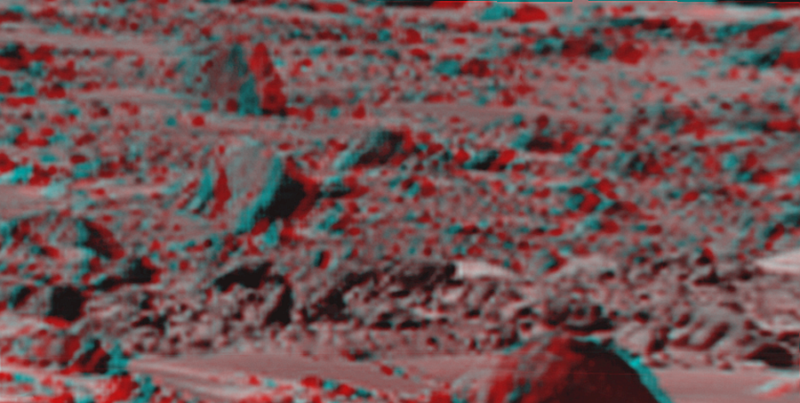 Very cold on the Martian surface. 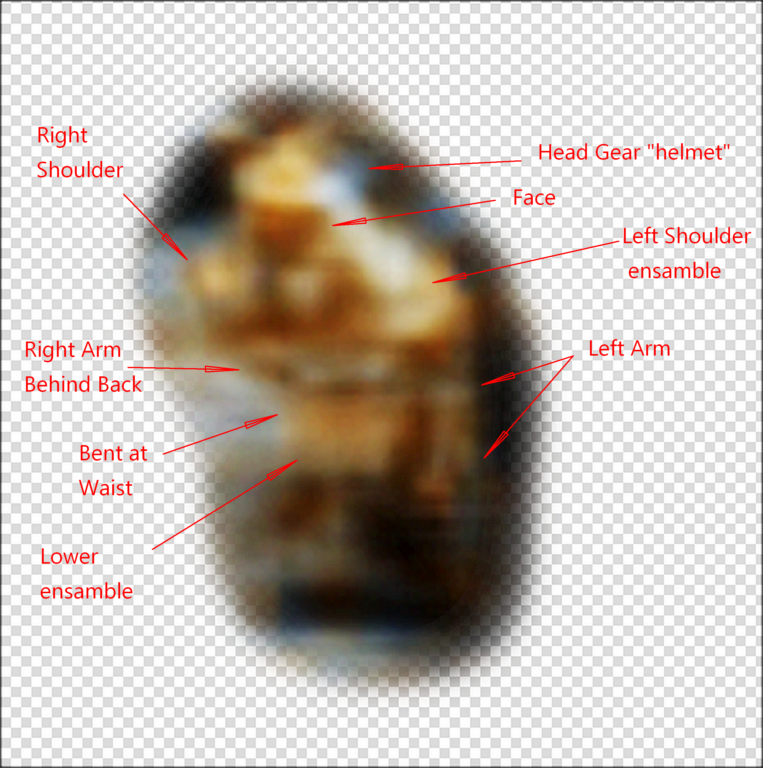 In this image below, we see a dressed being in possibly a golden outfit of some sort and circular head gear which has an almost "Persian" feel to the design. Again, it's tough to gather the scale here but by estimate, I would say the being is no more than 10" tall. Last edited by M-Albion-3D; 10-18-2018 at 09:15 PM. 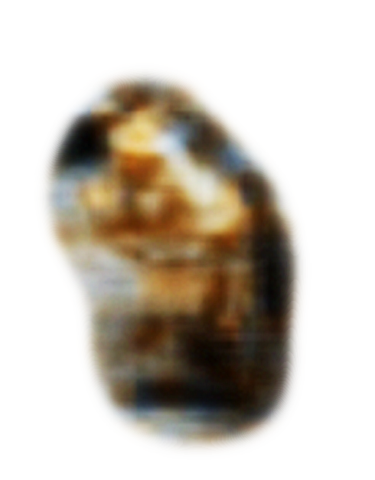 Although there is resemblance to an anthropomorphic figure, the legs are only "just" out of view. Though the upper proportions and dress pose do seem eerily familiar. Well at least he's not GREEN! When I slipped a 13" X 19" close up photograph in pretty good resolution (uncompressed .tif) under Mike's hotel room door, I was a little nervous as to the ramifications to what I had found in the bottom left had corner of the gigantic .jpg2000 (1.7gigs) image file. So when Mike gazed at the image, he knew where it was from immediately. It's a real beauty and exemplifies to the T as to the "method" used by the resident alien hand. 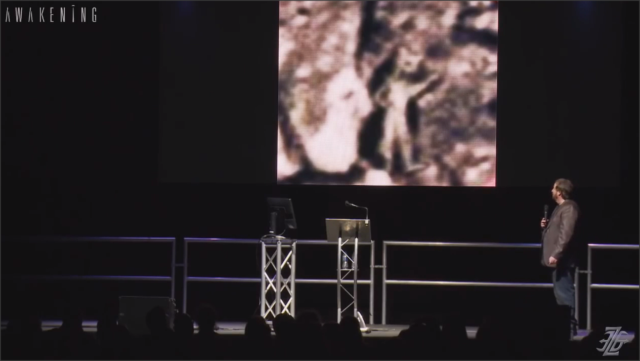 In the video shot at the Manchester 2017 "Awakening" convention. The speech was excellent, he kept the audience completely in check until questioning time and guess what image took the stage. Welcome to the Alien mind on Mars Mike! Last edited by M-Albion-3D; 10-25-2018 at 12:53 AM. Truthfully, I could write a hundred posts on this area of the Martian landscape but...I think it best to allow the viewer to discover these wonders without my description. Below, is a low resolution video and has just enough definition, but not close to the Hi res above. Ok, let me state this. In this video, there is more evidence of intelligent life than I have seen in 5 years of research! Take your time and allow your eyes to adjust to the depth of field, this is critical to discovery. Important. Both Windows Explorer, Opera and Google Chrome are worthless for playback. Firefox works great. Ok, just a little help. Look for the Human Indian face and discover this wondrous alien architecture in the distance!! Last edited by M-Albion-3D; 12-05-2018 at 07:14 AM. Remind me again, about the 3D glasses you reference. Typical Red and Blue lens? Fast 1.5Gb download at 15MB/s, took less than a minutes. 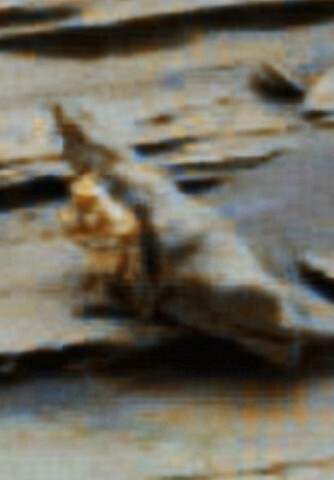 Also, having any luck with the new probe's pictures? Not yet, looking forward though to the weeks ahead. Here's the link for the glasses. The clip-on's are the bomb. Here's a comparison of two screen shot's of Chrome on the left and Firefox on the right. 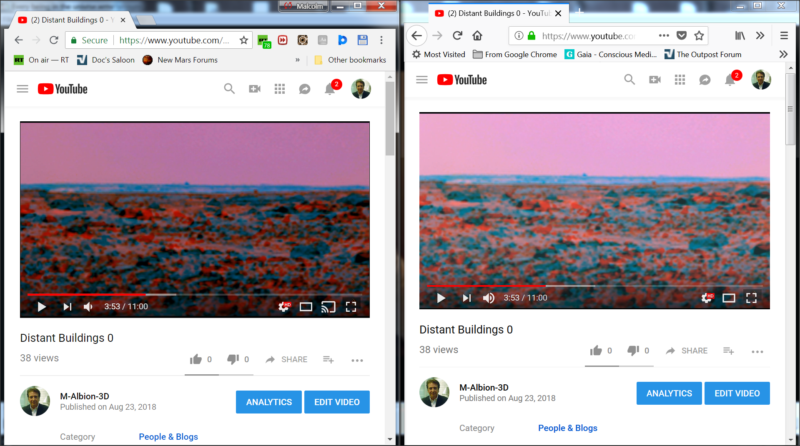 At first, I thought there was a problem with my video rendering software until I realized that Chrome, Opera and Explorer, for some unknown reason, were all darkening the video playback, until I downloaded the latest Firefox browser and presto...perfect! Any advice on this problem would be welcomed. Good news all around for me. I use Firefox as default browser. Google Chrome and IE/Edge both have too much browsing tracking for my taste, not sure why the dimming occurs with them. AND, my rather high end nVidea gamer video card came with 3D drivers, and a pair of Red/Blue glasses. Looks Like I'm all set... as time permits. Here's a snapshot of the area several meters from the lander and lo and behold, a beautiful Alien hologram dead center in the image, do you recognize the character? Clue, he's wearing Velma Dinkley's wig. 3D glasses required and you don't want to miss this one....many more to come in this landscape. Re Chrome darkening videos: on some machines this happens, and the culprits typically are ad blockers and/or hardware acceleration.